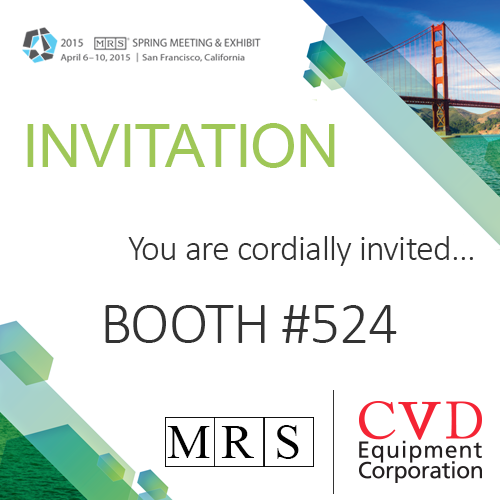 CVD Equipment Corporation, Booth #524, cordially invites you to attend the exhibit held in conjunction with the 2015 MRS Spring Meeting in San Francisco. Over 140 international exhibitors from all sectors of the global materials science and engineering communities will display a full spectrum of equipment, products, instrumentation, software, publications and services. Visit CVD Booth #524 and we will show you a range of high quality CVD 300 mm graphene samples fabricated with our new patent pending EasyGraphene™ manufacturing technology. We will be available to also discuss both your CVD graphene and nanomaterial manufacturing scale up needs enabled by our novel patent pending batch processing solutions. "Large-Scale Production of AB-Stacked Bilayer Graphene Using Ethanol as Precursor"
We will start the presentation with a description of the technique demonstrated by Pei Zhao and collaborators, see publication ACS Nano, 2014, 8 (11), 11631, to produce self-limited bilayer CVD graphene. We will then report on our use of this technique, combined with our patent pending graphene scale up technology, to produce large area bilayer CVD graphene on copper. Enhancements to our CVDWinPrC™system control software will be discussed, that can provide automated diagnostic feedback for liquid precursors in a bubbler configuration. The online process parameter calculations aid in the process development and stabilization of bilayer graphene and other nanomaterial synthesis.